I closely study people at all times. Watching their faces, eyes and expressions. It's always a mental game, a type of creative intellectual stimulation to try to imagine their life story. How did they get to this place, has their life been privileged or difficult? Were they loved passionately or silently? The list of questions spinning in my mind is endless. I once wrote an entire post about this, showing random portraits of Americans from Tennessee and asking readers to weave their life tales in comments. 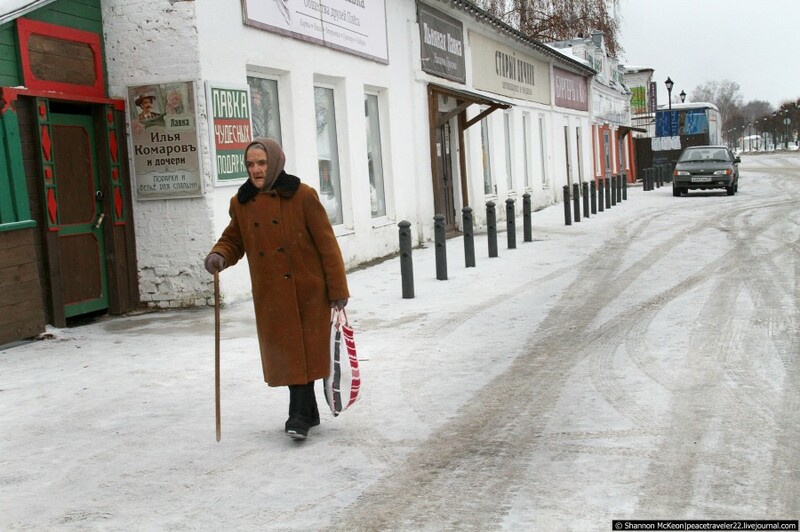 When I met this old woman walking in a Russian town, I didn't know whether to feel pity or admiration. It's difficult to imagine life in old age, no matter which country you call home. We never know what tragic or fortunate events await. Not in old age, nor day by day. I know only that in old age I'll be loved and taken care of. If not by a husband or lover, then by my immense family, which spans generations of all ages. Financially, I envision everything to be okay as well. I've saved in my own investments since I was 20 years old, so as to not rely only on a government pension in retirement. How do you feel when you look at this woman? Do you envision a good life for yourself as a pensioner in Russia? Bravo! No one is usually here on Sunday evening. :) Are you retired or still working? лучше умереть молодым ,чем увидеть себя слабым . Yes, it's sad to be alone, feeble and very ill in old age. Их пенсии уже разворованы царским режимом, а дети которые будут о них заботится не у всех. Поэтому многие россияне будут влачить нищенское существование после 65-70. Это если не умрут от болезней, т.к. медицина тоже "в прогаре". I think it's different in the U.S. A lot of people invest in their own 401k's and other retirement plans. We're not so conditioned to rely on the government for everything. There is only way to deal with this - don't think about this. I am retired with a Lithuanian pension, ridiculous pension based mainly on my Soviet wages So I live just because my husband supports me, then I will die too ))). It's interesting - you can still collect a pension from Lithuania even though you don't live there? Two incomes is definitely better than one!! :) But I've always supported myself. Did you ever obtain British citizenship? I feel she is a GKM and she's got a kvartira or three. While her children have not. Вот такие у нас старухи! I see them everywhere! Not only in provincial towns, but also walking with canes in snowy Moscow. Pensioner cut off electricity for the debt of = 3 $. She froze. In what city is this? Do you think pensioners live better in Ukraine? Just curious. Well, many Russians are fatalists. So this expression seems appropriate. Retire to earn in his youth, we called it "the funded part of"
I am glad that now molodesh more responsible attitude towards the future. In the U.S, people plan for the future themselves, and many invest privately. They don't just rely on the government to support them in old age. Thus, it's easier to live better in old age. Yes, it's great that the retirement age is younger in Russia. But life is much harder there, so everything equals out in the end. It's outrageous that the U.S. is considering raising the official retirement age to 69 - this is too old!! I will hopefully retire by age 60. Что там Шеннон у меня спросила выше,не очень понятен смысл? I've no idea what my life will look after retirement. Things changes so fast here. I have little savings, but i spend them on traveling. So i'm trying to not think about life after 60. She's a human being like everyone else. I don't see why one should have all those strong feelings. Why pity? Why admiration? I can tell you why she's carrying a stick. It's very slippery on the roads; and if she falls and breaks a hip, life will be much harder for her. It's just life. You may think people like her are very different from the people you encounter in your day-to-day life. Not much, actually. I think she's very different actually. I don't see very many old people struggling on canes in the U.S., walking on icy sidewalks in freezing cold winter to simply take a bath. This woman was on her way to the banya. We spoke to her.